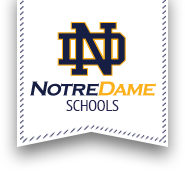 Please join Notre Dame Jr/Sr High for a Back-to-School Barbeque, hosted by the Booster Club on Wednesday, August 30th from 5:00pm-7:00pm. Meet and greet new fellow classmates and welcome new families. There is no cost to attend and all students must be accompanied by an adult. Please RSVP with the student(s) name and the number of guests to Olivia Tooley at otooley@syrdiocese.org by Friday, August 25th.